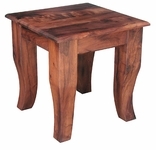 Handcrafted Solid Mesquite Wood Furnishings for Lasting Elegance. Our fine Mesquite furniture has the unique ability to captivate an entire room and radiate its warmth and rustic beauty throughout. Mesquite wood has the same properties of other fine hardwoods, making it a favorite of custom woodworkers for creating quality furniture, unique carved doors, beautiful staircases and durable flooring. The stable nature of mesquite and the rustic character of the wood, with its earthy grain and subtle imperfections, make mesquite furniture one of the most popular for adding rustic elegance to southwest and Spanish colonial decor. The dark reds and rich browns of our solid mesquite furniture will establish a rustic presence for you to build upon in your home. Our collection of hand crafted Mesquite furnishings include dining tables, chairs, armoires and more. 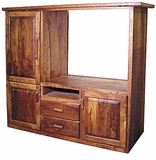 Each piece of fine mesquite furniture is truly a work of art to be cherished and enjoyed for many years in your home. Let us give you an estimate on your custom mesquite needs. Call us toll-free at 1-866-234-8744. Click on the mesquite furniture sections below.